Durability – The average lifespan of a tile roof is 50 years or more. Design flexibility – Modern and elegant, tile roofs come in a variety of colors and styles to suit any taste or budget. Performance – Tile roofs are proven to perform better than traditional asphalt or slate roofs in harsh weather conditions. Energy efficiency – Tile roofs are highly reflective which helps increase the efficiency of heating and cooling systems. While the initial investment is high, tile roofs more than pay for themselves in terms of performance and longevity. 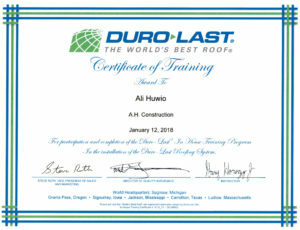 If you are interested in having a tile roof installed, look no further than A.H. Construction & Roofing Company–Ypsilanti and Southeast Michigan’s number one roofing installer and contractor. Our team will expertly install your tile or other specialty roof in one day or less. Fully-insured and fully-certified, A.H. Construction & Roofing Company offers the full range of end-to-end roofing services including tear-offs, re-roofs, flashing repairs, and re-decks. We also offer seasonal services including ice dam and snow removal, and emergency repairs in the event of heavy wind or rainfall. We provide extended warranties on our CertainTeed and GAF-certified products, as well as a 100% satisfaction guarantee. No matter the type of service, we will work with your budget and your schedule to ensure your needs are not only met–but exceeded. Give us a call today at 734-481-1983 for a free tile roof consultation or to schedule a roof inspection.